Our Bifold Double Glazed Door is the most asked about door in our range, since the multi-panel bifolds offer a modern and reasonably priced solution for creating wide, uninterrupted views. An alternative to French or Sliding doors, the Bifold Double Glazed Door develops an unrivalled sense of class while creating a spacious, modern interior - ideal for entertaining or for boutique hotels. Feel the freedom from many of the common limitations that inevitably frustrate the design intent with exceedingly restrictive panel dimensions resulting in too little glass, a scarcity of finish selections or hardware options, inappropriate glazing combinations, or obtrusive sills that often diminish the message conveyed by the architecture. Our Double Glazed Bifold Door panels are constructed from a hard-wearing, tough and reliable upvc profile which is reinforced for structural integrity, and incorporates high quality hardware so that you can enjoy the scenery as well as thermal and acoustic comfort without the maintenance that is expected at that level of performance. 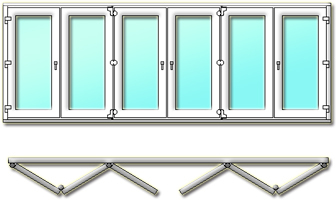 Bifolds are appropriate for internal uses: separating studies or libraries which lead into the living room, or room division between lounge and dining; and are commonly placed to lead into balconies, patios, pool decks and gardens which breaks with straight lines and causes a visually dramatic effect when the playful hues of light shining through the glass. 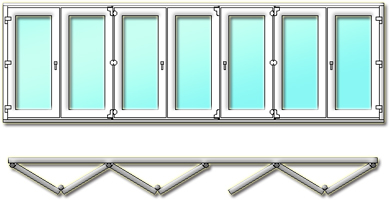 With the capacity to span an entire space and to open it up completely, the Double Glazed Bifold door will allow a garden or pool deck to become part of a room on a pleasant day, and can even double its size. However, for privacy the doors may either have obscure glass or a solid panel depending on the purpose and specifications. Another useful feature is that the threshold can be completely flat - invaluable for wheelchair users, or families with small children who may have difficulty negotiating over a ledge, or even around a swimming pool. If there are views from your home, consider varying the window and door arrangements and using in combination with different styles of windows and doors to embrace the dynamic nature of the surrounding environment. Bifold Double Glazed Doors offer a timeless elegance and modern flexibility, and can be made to match the interiors of your home, office or restaurant, while decreasing reliance on electrical heating and cooling, decreasing the carbon footprint. We will turn your dreams into reality by assessing your needs, delicately hand - crafting and carefully installing each masterpiece. This double glazed door combination consists of three double glazed panels, with all double glazed panels opening on the left. 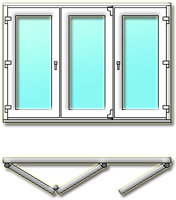 This bifold double glazed door combination can be reversed in direction (left or right), or used as opening in, instead of opening out. This door is appropriate to use for aperture size from a minimum of 1500mm to a maximum of 2400mm in width. If the sizes of your intended double glazed application exceed this, then consider another bifold combination that accommodates your sizes. All bifold double glazed windows and doors can be produced as top hung or bottom hung, according to customer needs. This double glazed door combination consists of three double glazed panels, with two double glazed panels opening on the left and the remaining panel on the opposite side - right. 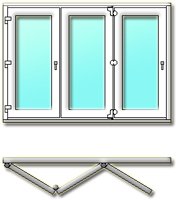 This bifold double glazed door combination can be reversed in direction (left or right) or used as opening in, instead of opening out. This door is appropriate to use for opening size from a minimum 1500mm to a maximum of 2400mm in width. If the sizes of your intended double glazed application exceed this, then consider another bifold combination that accommodates your sizes. All bifold double glazed windows and doors can be produced as top hung or bottom hung, according to customer needs. 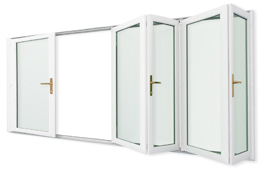 This double glazed door combination consists of four double glazed panels, with three double glazed panels opening on the left and the remaining panel on the opposite side - right. This bifold double glazed door combination can be reversed in direction (left or right) or used as opening in, instead of opening out. This door is appropriate to use for opening size from a minimum 2000mm to a maximum of 3600mm in width. If the sizes of your intended double glazed application exceed this, then consider another bifold combination that accommodates your sizes. All bifold double glazed windows and doors can be produced as top hung or bottom hung, according to customer needs. This double glazed door combination consists of five double glazed panels, with all five double glazed panels opening on the left. This bifold double glazed door combination can be reversed in direction (left or right) or used as opening in, instead of opening out. This door is appropriate to use for opening size from a minimum 2500mm to a maximum of 4500mm in width. If the sizes of your intended double glazed application exceed this, then consider another bifold combination that accommodates your sizes. All bifold double glazed windows and doors can be produced as top hung or bottom hung, according to customer needs. 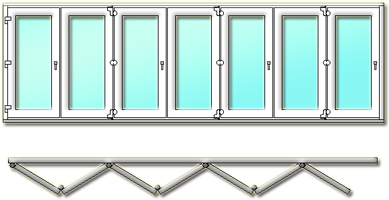 This double glazed door combination consists of five double glazed panels, with first three double glazed panels opening on the left and the remaining two panels on the opposite side - right. 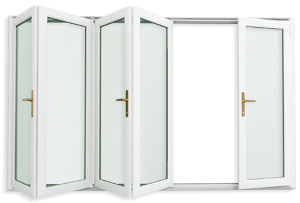 This bifold double glazed door combination can be reversed in direction (left or right) or used as opening in, instead of opening out. This door is appropriate to use for opening size from a minimum 2500mm to a maximum of 4500mm in width. If the sizes of your intended double glazed application exceed this, then consider another bifold combination that accommodates your sizes. All bifold double glazed windows and doors can be produced as top hung or bottom hung, according to customer needs. 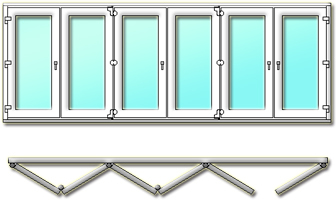 This double glazed door combination consists of five double glazed panels, with four double glazed panels opening on the left and the remaining panel on the opposite side - right. This bifold double glazed door combination can be reversed in direction (left or right) or used as opening in, instead of opening out. This door is appropriate to use for opening size from a minimum 2500mm to a maximum of 4500mm in width. If the sizes of your intended double glazed application exceed this, then consider another bifold combination that accommodates your sizes. All bifold double glazed windows and doors can be produced as top hung or bottom hung, according to customer needs. 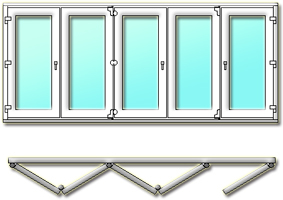 This double glazed door combination consists of six double glazed panels, with three double glazed panels opening on the left and the remaining three panels on the opposite side - right. This bifold double glazed door combination can be reversed in direction (left or right) or used as opening in, instead of opening out. This door is appropriate to use for opening size from a minimum 3000mm to a maximum of 5400mm in width. If the sizes of your intended double glazed application exceed this, then consider another bifold combination that accommodates your sizes. All bifold double glazed windows and doors can be produced as top hung or bottom hung, according to customer needs. 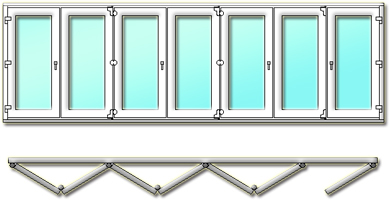 This double glazed door combination consists of six double glazed panels, with five double glazed panels opening on the left and the remaining panel on the opposite side - right. The bifold double glazed door combination can be reversed in direction (left or right) or used as opening in, instead of opening out. This door is appropriate to use for opening size from a minimum 3000mm to a maximum of 5400mm in width. If the sizes of your intended double glazed application exceed this, then consider another bifold combination that accommodates your sizes. All bifold double glazed windows and doors can be produced as top hung or bottom hung, according to customer needs. This double glazed door combination consists of seven double glazed panels, with all seven double glazed panels opening on the left. The bifold double glazed door combination can be reversed in direction (left or right) or used as opening in, instead of opening out. This door is appropriate to use for opening size from a minimum 3500mm to a maximum of 6300mm in width. If the sizes of your intended double glazed application exceed this, then consider another bifold combination that accommodates your sizes. All bifold double glazed windows and doors can be produced as top hung or bottom hung, according to customer needs. This double glazed door combination consists of seven double glazed panels, with six double glazed panels opening on the left and the remaining panel on the opposite side - right. 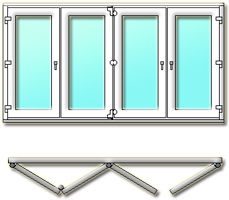 The bifold double glazed door combination can be reversed in direction (left or right) or used as opening in, instead of opening out. This door is appropriate to use for opening size from a minimum 3500mm to a maximum of 6300mm in width. If the sizes of your intended double glazed application exceed this, then consider another bifold combination that accommodates your sizes. All bifold double glazed windows and doors can be produced as top hung or bottom hung, according to customer needs. 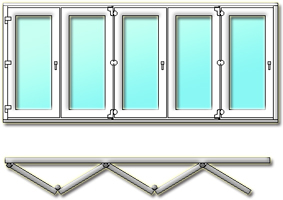 This double glazed door combination consists of seven double glazed panels, with four double glazed panels opening on the left and the remaining three panels on the opposite side - right. The bifold double glazed door combination can be reversed in direction (left or right) or used as opening in, instead of opening out. This door is appropriate to use for opening size from a minimum 3500mm to a maximum of 6300mm in width. If the sizes of your intended double glazed application exceed this, then consider another bifold combination that accommodates your sizes. All bifold double glazed windows and doors can be produced as top hung or bottom hung, according to customer needs. Operational tests are carried out on the handles on the bifold doors itself. This means that, not just the function, but also the durability of the attachment between hardware and window is tested thoroughly. They are given the equivalent of 50 operational cycles a day over a period of 10 years. 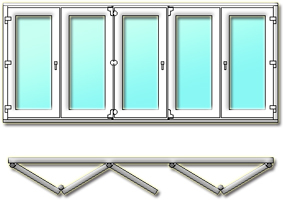 Neither the bifold doors handle itself, or any part of it, must become loose during the course of the test. This ensures the components Double Glazed Windows and Doors use perform consistenly well, so that our customers enjoy a trouble free use of their windows!